Before you buy a battery powered outdoor security camera, you need to figure out what feature matters to you and what doesn’t, what’s the ideal location to place a wire free battery CCTV security camera, how to protect it from vandalism, etc. Read this post to find all the answers and make your decision much easier. If you’ve got some ideas you want to share or any problems about wireless battery powered outdoor security cameras, leave your comment below and we’ll reply to you in no time. Note: Click here if you want to buy a wireless battery powered security camera for indoor use. With hundreds of battery operated outdoor security cameras to choose from, are you clear which features rank the top when it comes to choosing the best ones? Below we list several important factors you should check out before buying a battery powered security camera. And in case we miss something you care about, leave a comment below to share your ideas! Just as the name implies, the battery powered outdoor security IP cameras are designated for outdoor purpose. In order to withstand various harsh weather conditions, it is a must-have feature for them to be rainproof and weather resistant. The IP rating, a two-digit number, is used to how a battery-operated outdoor wireless security camera can be protected against solid objects and liquids, like the rain, dirt, etc. IP 65 is currently the highest standard of weatherproof battery powered WiFi surveillance cameras. Yet not all wireless battery operated wireless outdoor security cameras in the market can reach that. Reolink Argus® Pro and Reolink Argus® 2 are just the IP65-certified weatherproof battery powered wireless security IP cameras and can brave all the elements. And this high quality video captured by Reolink Argus® 2 BEST demonstrates how it stands against the heavy snow and extreme cold. The Reolink Argus® 2 battery powered security camera never quits in front of the freezing cold and heavy snow. It is capable to brave all the elements and keep tabs on your property day and night. So you don’t need to be physically there in the frosty winner. On top of the IP code, the working temperature of battery powered outdoor security cameras is another important factor you should consider, which is normally listed in the product specification page. Note that the operating temperature actually refers to the wireless battery outdoor security cameras’ starting temperature. What that means, in a nutshell, is that once the battery powered outdoor WiFi cameras are activated and heated, they can continue to work in cold extremes. I bet no one expects to get fuzzy pictures from a heavily-invested battery powered outdoor security camera. The battery powered WiFi outdoor security IP cameras with great night vision can not only provide a peek at what really goes bump at night, but also help you discern faces and objects in dark situations. And now some high-end wireless battery operated outdoor security cameras, like Reolink Argus® 2, are even featured with starlight night vision in virtue of the advanced Sony CMOS sensors. So you can see the objects in real color at night and identify human clothing or other details from afar, say 33 feet away. For detailed information about the battery powered outdoor security cameras with night vision, you may refer to the expert buying guide. 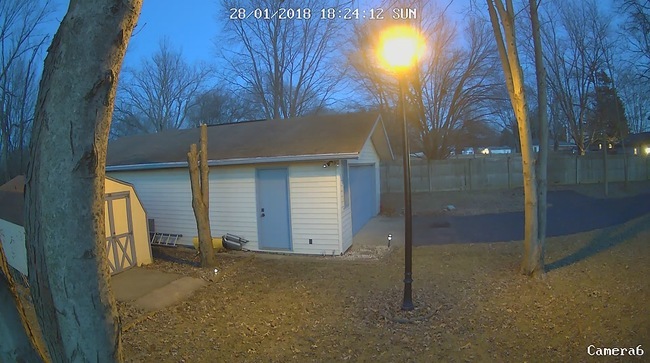 Watch the picture below to check out the image quality of Reolink Argus® 2 at night, a 1080p outdoor battery operated high definition security camera system. Intend to put up a wireless battery operated outdoor security camera in environments with a sharp contrast of lighting (also called wide dynamic range)? That’s when the battery powered outdoor security cameras with WDR ability should top your wish list, which provide an effective solution in the challenging lighting scenarios. They can tackle scenes with varying light and harsh lighting conditions, and offer near perfect exposure in both bright and dark areas simultaneously. When the detail and visibility are needed for outdoor areas, the role of WDR function becomes more prominent for battery powered WiFi outdoor security IP cameras. Though the wireless battery powered outdoor CCTV security cameras offer you flexible placement, at least you should place them within the WiFi coverage for normal work. Also, check the WiFi distance of battery powered wireless outdoor security camera systems and see whether it applies to your situation. For the battery powered long range wireless security cameras which transmit data over the traditional 2.4Ghz WiFi or 5Ghz WiFi network, the WiFi connection is required if you want to view the video remotely. But worry not if the battery powered security cameras have no WiFi and power! Thanks to the 4g security cameras that operate on the 4G/3G mobile network, you can now also monitor the places where WiFi connection and electric power are not available. 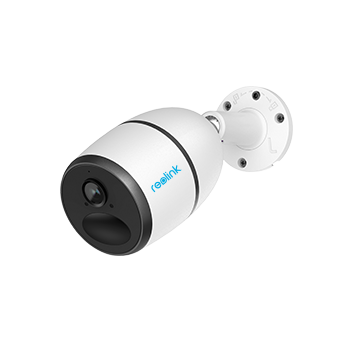 Take the 4G/3G battery powered outdoor security camera Reolink Go for example, it provides an ideal security solution for areas without WiFi network, such as your barns, farms, boats, docks, construction sites, vacation home, etc. And you can also watch the live feed anywhere & anytime on your smartphone. Battery life is always an important factor for you to consider when it comes to selecting battery powered outdoor wireless security cameras and systems. To avoid frequent battery change (or charge) and reduce your cost, choose the battery powered outdoor WiFi surveillance cameras with rechargeable batteries and longer battery life. But how do you know if the battery power is running low, as you may ask. Well, most battery-operated outdoor wireless security cameras would send you low-battery notifications when the battery capacity reaches a certain low value, say, 10%, to avoid the batteries dead without your conscious. And those wireless battery operated outdoor security cameras with flexible powering options are even far more reliable. Taking the Reolink rechargeable battery powered outdoor security camera for example, it can get non-stop power from the rechargeable battery (comes with the camera) and Reolink solar panel (sold separately), which is quite cost-effective and eco-friendly. Bonus: Learn some practical tips and tricks to extend the battery life of battery-only outside security cameras. There are basically two ways to install the wireless battery powered outdoor security cameras, either to place it on a magnetic base or to an outdoor security mount. To make your battery powered outdoor CCTV security cameras indestructible, the latter installation is more recommended and you won’t have to worry about someone walking off with the wireless battery operated outdoor security cameras. Besides, you need to allow for the security level of battery powered outdoor wireless security IP cameras and systems. Ask the security providers what major enabled security settings are provided. 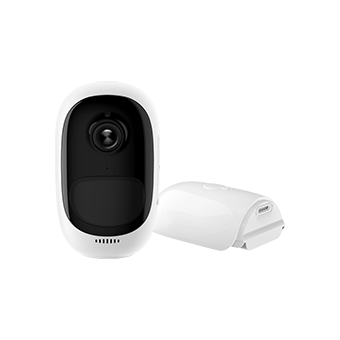 For example, the battery-operated outdoor wireless security cameras Reolink Argus® Pro and Reolink Argus® 2 offer multi-level security features, including SSL encryption, WPA2-AES encryption, and SSL-TLS enabled to prevent prying eyes. Now most of battery powered outdoor security cameras comes with a free and customized app provided by the camera sellers, which excels the third-party app in both price and performance. Any adjustment you want to make of your wireless battery operated outdoor security cameras, like adjusting the motion sensitivity, enabling push notifications, can be simply done via the app on your smartphone. Also, you can manage more than one battery operated outdoor surveillance cameras on the same app, making it an easy task to keep tabs on multiple places simultaneously. As the rule of thumb, the sellers would release new app versions on a regular basis to unlock new features of battery powered outdoor IP cameras. So it is recommended that you upgrade your app to the latest in order to get the most of your battery powered outdoor WiFi security cameras. Then you should consider buying the battery outdoor security cameras with SD card (slot) for local storage, requiring no contract or monthly subscription fees. And the footage is also kept safe from possible snooping risks online. So you can rest assured that your personal privacy can be better secured. If you would like to back up the recordings of your outdoor battery operated high definition security cameras to the Cloud, read this expert guide for professional advice. Note: In addition to these features, the battery operated outdoor WiFi security camera with smartphone App, memory card for self storage, smart motion detection and remote access are also important factors. Leave a comment to share the other features you care about. To get the most from your wire free battery powered outdoor security cameras, it is important for you to place the wireless battery operated security cameras in the right and appropriate positions. Before installing battery powered outdoor WiFi security cameras, you need to think about where the most vulnerable places are for people to break in. According to the home burglary statistics, the main entrances, front/back porch, garage, backyard, off-street windows and side-gate are the top places for you to place wireless battery operated outdoor CCTV security cameras. Placing the battery operated outdoor security cameras too high may disable you to see details. Head height is best to capture the face of an intruder. So make sure that the battery powered WiFi outdoor security camera is high enough to be out of reach but low enough to capture the intruder’s face. Do not place the battery powered outdoor security cameras and systems directly into the sun, otherwise the sunlight will cause stripes in images. Also, remember to position the wireless battery operated outdoor security cameras at an angle to avoid backlight from windows and doors. Bonus: Read more about the tips on where to place wireless battery powered outdoor security cameras. This might be a problem that bothers most users of battery powered outdoor security cameras and systems. And here are some proactive tips to protect your battery operated outdoor wireless security cameras from vandals and thefts. As it is mentioned above, placing the battery powered outdoor security cameras to sturdy mounts is more secure than to the magnetic base. It takes more time and efforts for the thieves to steal and they will have to think twice before their evil action. Positioning the outdoor battery operated high definition security cameras beyond reach can effectively avoid the naughty kids tampering with your cameras. It can also reduce the chance for the thieves to walk away with your battery powered wireless outdoor security cameras. Don’t Miss: Tired of all the trouble you have to go through when you need to change the batteries of your battery operated outdoor wireless security camera, especially if the camera is placed out of easy reach? The solar powered & battery powered outdoor security camera Reolink Argus® Pro and Reolink Argus® 2 can free you from such annoyance by providing continuous power from the solar panel and a rechargeable battery. So you no longer need to exhaust much effort to access your hard-to-reach cameras frequently. A tough protective housing/skin is helpful to protect your battery powered external WiFi security IP camera from vandalism. Besides, it can make your battery powered wireless outdoor security camera blend into the external environment, thus others won’t easily notice its existence. 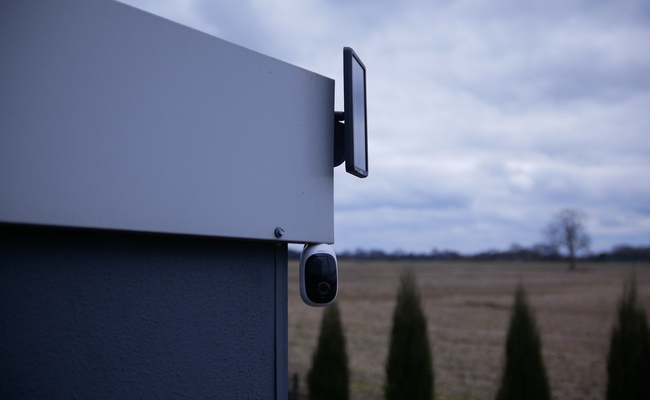 Reolink, for example, intends to offer UV- and water-resistant silicone protective skins for its battery powered outdoor security camera Reolink Argus® 2, so that the camera can blend in the color of the wall, ceiling or any surface it is mounted to. Placing your battery powered outdoor security cameras in a not-so-obvious location with coverings is also a good method to protect them from vandals or thefts. 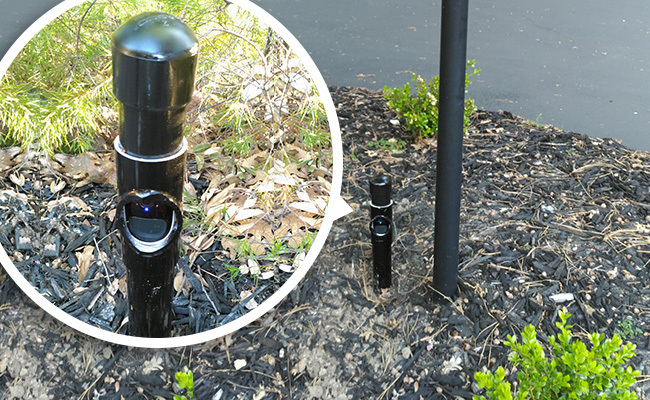 An artificial plant, an outdoor low voltage lighting fixture and the bushes are all discreet locations to hide your battery operated outdoor wireless security cameras. One brilliant user who bought 6 Reolink battery powered cameras, got his wireless battery outdoor security cameras hidden in plain sight, but also greatly enhanced the defense against intruders (as shown below). This can not only provide additional protection for outdoor battery operated high definition security cameras from rain, snow, or hail, but also help keep the camera lens clean from any moisture or residue. So, what are the best wireless battery powered outdoor security cameras for sale now? After reading the battery powered wireless outdoor security camera reviews and comparing the product features, here we’ve picked up one of the best battery operated exterior security cameras – Reolink Argus® 2. Most of the users love the idea that it can get non-stop power from the solar panel (sold separately) and a rechargeable battery, as they don’t need to access the camera to charge battery frequently. In virtue of the 1080p high resolution and IP 65 rating, you can place this battery-operated outdoor wireless security camera indoors and outdoors as you wish. And what can you expect from this best wireless battery powered outdoor security camera? Find your answer in the following battery powered wireless outdoor security camera reviews of Reolink Argus® 2 from the top-tier tech media. In addition, this smart outdoor battery operated high definition security camera is also featured on lots of other top-tier media, including Techradar, Techhive, 01net, Make Use Of, Androidpolice, Home Alarm Report, MacFormat, Maclife, Stuff, etc. Now watch the high quality video below shared by a real user of Reolink Argus® 2. Though it is difficult to say, with confidence, which is the all-round best wireless battery powered outdoor security camera systems on the market, Reolink Argus® 2 is absolutely the clear winner among the best battery powered wireless outdoor security cameras. Can’t Miss: Reolink recently launched a new Argus family member — Reolink Argus® Pro for another wire-free security solution at a much more affordable price. This battery operated outdoor security camera shares almost all the highlights as Reolink Argus® 2 except the starlight night vision. In virtue of the rich features and compact design, it is highly rated that “the $100 price tag is well worth it’s weight in gold”. Rechargeable Battery or Solar Powered; Outdoor/Indoor Protection; 1080p Full HD; Smart Motion Detection; 2-Way Audio; Live View Anytime Anywhere. Below we’ve collected some common questions you may ask about the battery-operated outdoor wireless security cameras. And please feel free to comment below if you have more to ask. Whether you prefer a low-profile or noticeable WiFi battery powered outdoor CCTV security camera, the installation location, in some ways, is a non-ignorable and even decisive factor. To make your wireless battery powered security cameras unobtrusive outdoors, you may refer to the tips above to hide them in discreet places (shown in the video below). Wonder how to hide your battery powered security cameras? 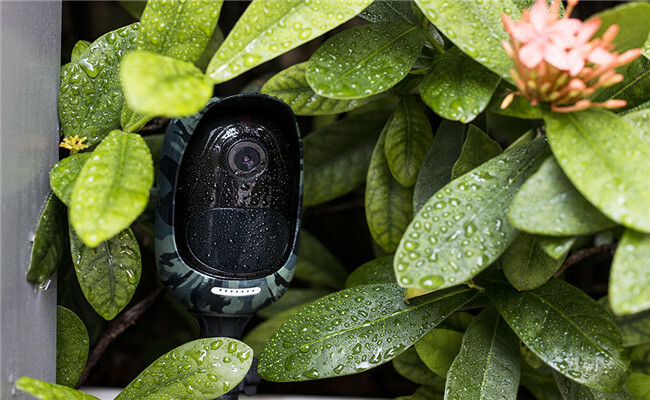 Taking the Reolink Argus® 2 battery outdoor security camera for example, you may add skins to help it blend into the environment and take advantage of the artificial plants, bookshelves, or stuffed toys to hide the camera. Or if you want your cameras to be noticeable so as to stop the burglars from targeting your home, install your outdoor battery powered IP cameras in the conspicuous sites, like your front door, side and back doors, first-floor windows, etc. When the motion detection of your battery powered outdoor security cameras is not needed or desired, you may disable the PIR motion sensor via the app on your smartphone. In this way, it can also greatly optimize the power consumption of your battery powered outdoor security cameras. One of the biggest advantages of battery powered outdoor security cameras is that they are 100% wire-free. So you don’t need to hire professionals to run the messy cables. Simply insert the battery into your battery operated wireless outdoor security camera and connect it to your WiFi network. When your security needs have changed, you can also easily take away your battery powered WiFi security cameras and reposition them in a new site, all of which can be completed by yourself even you are not a tech savvy. It largely depends on which battery-operated outdoor wireless security camera you choose and location where you place the camera. For Reolink battery powered wireless outdoor security cameras, the WiFi distance is about 70-80 meters (210-240 feet) in open areas without any obstacles. And when you place the battery powered WiFi security cameras indoors with 2 walls in between, the WiFi distance can reach about 20 meters (60 feet). Note that the real distance varies with your environment. And the key point is to place your wireless battery powered security cameras close to your router as possible, so that you can have stable WiFi signals. Editor’s Note: In case you have any questions, suggestions, and of course corrections, please share your thoughts in the comments below. This entry was posted in Buyer's Guide and tagged battery cameras, recommendations, reviews, selection tips, wire-free cameras. Hi Regina, it depends on the distance between the PoE system and the cameras. If they are too far away from each other, you will be unable to run the wires. The best recommendation for you is to get separate PoE systems for the two buildings and here are the best picks for you: /product/rlk8-410b4/, /product/rlk16-410b8/. Hi Regina, the wires can go as far as 300 feet. So the PoE systems recommended above will work well in your situation. a) Do the security camera’s have a mechanism for firmware update and how is it done? c) Do all camera’s capture audio too? The sample video with rain has audio while the night vision video did not. a) we offer firmware updates on a regular basis and you can subscribe to us to keep informed and download the latest version from our official website. b) All of Reolink security cameras are secured by enabling multi-level security features, including SSL encryption, WPA2-AES encryption, and SSL-TLS enabled. c) Yes, Reolink Argus supports audio recording. You can also disable it based on your needs in the camera settings. That’s why the night vision sample video has no audio. Thanks so much, can’t believe I actually Won, can’t wait to receive it. Congratulations!!! We will ship the product to you soon. Please feel free to share the amazing videos recorded by your Reolink Argus after you receive it and you will have a chance to win Up to 20% OFF coupon & FREE Reolink Argus, /share-captured-videos/. Much appreciation to Jenny Hu for the great informative write up on battery powered outdoor cameras. The Argus is on my wish list at this moment! I just landed a great deal on the Reolink RLK8-410B4 8-Channel 4MP PoE Security Camera System, but I have not installed it yet. I’m looking to add other cameras as well. Is the Argus able to integrate with the RLK8-410B4 POE NVR system? Or can I view all the POE cameras and the Argus all at once on the Reolink Client or app? Hi Ozzie, thank you for reaching out and your big support of our products. Yes, you can view all the PoE cameras and Reolink Argus all at once on the Reolink App, but the Argus, as a battery operated security camera, is unable to integrate with the PoE NVR system in order to save the power consumption. If you still have any other questions, please feel free to let us know anytime. I’ve conncrecvto company WiFi is this traceable back to me? Hi there, do you mean is your private information secure if you’ve connected to the company WiFi to access the camera? Hi, yes that and could they see what I’m seeing? 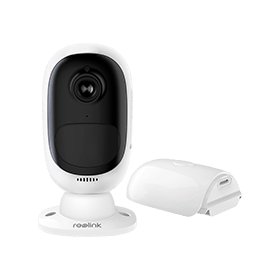 Hi there, all of Reolink security cameras are featured with major enabled security settings, including SSL encryption, WPA2-AES encryption, and SSL-TLS enabled. So you can rest assured that your private information will be protected from the prying eyes. Hi there, thank you for reaching out. If you want to view the live videos on your phone, yes, the Internet connection is required. But the camera can still record motion triggered events on the memory card if your place has no WiFi available, then you can take out the SD card and view the footage on your computer. If you still have any other questions, plz feel free to let us know. Question: I would like to use your battery powered camera and continuously record onto the memory card…is the camera only activated by motion? Are there models you would recommend? Also, I have xfinity home and wondered if any of your cameras will sync up… (probably not battery powered?)…Thanks! Hi Brad, the battery powered security cameras are designed to record only motion activated events in order to conserve the power consumption. If you would like to do continuous recording, you may check out these popular security camera systems: /product/rlk4-210wb2/ ; /product/rlk8-410b4/. Also, all of our IP cameras (except the battery powered security cameras) are compatible with ONVIF third-party software and you can learn more information here: /3rd-party-compatibility/. If you still have any other questions, please don’t hesitate to let us know and we’d love to help! Hi there, the operating temperature of both Reolink Argus and Argus 2 is -10℃~+55℃, and actually this refers to the cameras’ starting temperature. So once the cameras are activated and heated, they can continue to work in cold temperatures. If you need one cold weather security camera that will turn with zoom feature, we high recommend the outdoor PTZ (pan, tilt and zoom) security camera Reolink RLC-423 for you, /product/rlc-423/. It features IP66 waterproof and possesses a weather-resistant metal aluminum housing, making it work perfectly in harsh weather conditions. When device records on to the sd card does is automatically delete info and record again when card becomes full? Or are there notifications that card is almost full? Hi David, when the SD card becomes full, the older files will be automatically overwritten by the newer ones. And you can also check the free space of your SD card on the Reolink App/Client, so that you can back up those important files before they are overwritten. Hope this would help. Hi Margo, battery operated security cameras are not designed for 24/7 recording in order to save power consumption. When motions are detected, they will wake up at once and record the motion-triggered videos onsite. Check the star product of our battery IP cameras here, /product/argus-2/. You can also easily access this camera on your phones or PCs. Please let me know if you have any further questions. Hi, Margo, yes, you can manually record & play back videos remotely on your computer (not for DVRs). And the footage will also have a time stamp (as shown in the video samples above).